There is only one Quail West. From the moment of arrival, this very private secure community distinguishes itself in every way. The cobblestone paver streets with lush landscaping usher you into an environment in which every detail has been beautifully conceived and carried out. 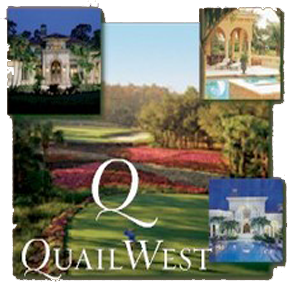 Quail West offers two outstanding 18-hole golf courses designed by Arthur Hills. Limited to only single-family homes on estate-sized lots, and the Quail West country club gives you everything you want and nothing you don’t. Enjoy the Riviera style Beach Club and the Personal Concierge Service along with the world-class spa and fitness center. There is excellence in every detail, to cater to any desire. A full calendar year of planned events as well as cooking classes with premier chef. Quail West is your paradise in paradise.